The League is America’s independent bicycling advocacy organization. Not a League member? Now is a great time to join! Our members keep the League moving forward, through financial support, strategic direction, and political action. 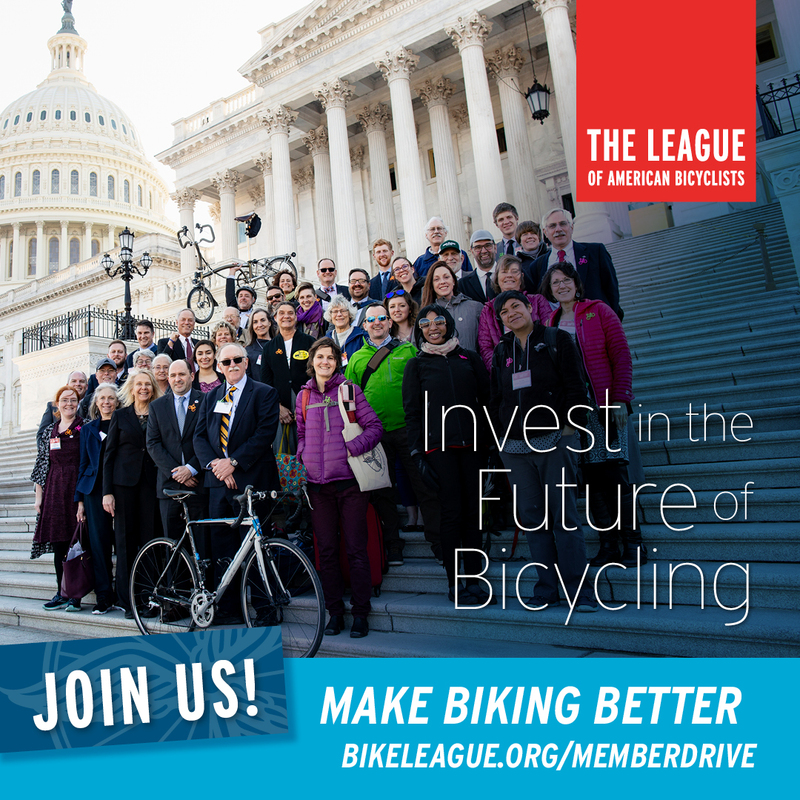 With our members, the League is the leading voice for bicyclists’ rights on Capitol Hill. Join the League today and be part of building a more Bicycle Friendly America for everyone. In March, hundreds of League members climbed the Hill in Washington, DC, at the National Bike Summit, where together we generated momentum around policies and funding for safer biking and walking. To make our case, we’re collaborating with like-minded organizations to lobby for safer ways for all Americans, young and old, in urban areas and rural ones, to bike and walk. And you may have recently seen the League advocating for a tax break for bike commuters in Bicycling Magazine. Every day, we’re the voice of the cyclist on Capitol Hill. Together, our advocacy will make biking better for generations to come. Support our work to make bicycling safer and more accessible by joining the League. On Capitol Hill, we’re building a ‘Bike-Partisan’ coalition to galvanize support for legislation like a tax break for commuters and putting more data on bikeability into the hands of transportation planners. Online, we’re activating tens of thousands of bicyclists in grassroots activism to advance policies and funding that result in safer roads and bike-centric projects at the local level. Just recently, we worked with advocates in Alabama to pass legislation preventing distracted driving, which often has deadly consequences for cyclists. And we’re presenting a vision for how we get to a more Bicycle Friendly America through our Bike New Deal, which includes seeing the U.S. become a leader in youth bicycling education and new car safety. League members enable our work protecting our right to ride. Thousands of communities, universities and businesses have shifted into gear, creating better places to ride so they could be recognized by our Bicycle Friendly America program. The League sets the standard for what makes a place worthy of being called “bicycle friendly” based on our robust qualitative framework as well as feedback from local League members. The League and our member clubs work with cities, counties, and states to ensure bicycling isn’t a mere afterthought in the infrastructure planning process and cyclists see fewer bike lanes to nowhere. Our Fall 2018 round of Bicycle Friendly America awards saw 45 universities, 61 communities, and 82 businesses recognized for their efforts to support bicyclists. Each year, we’re growing the faculty of League Cycling Instructors, who teach thousands of adults and kids throughout the U.S. how to be confident and joyful on bikes. In January we welcomed two new League Cycling Coaches, Jamie and and Jan, who will lead LCI training seminars and help expand the reach of our education programs for people who bike and for drivers, through our new Bicycle Friendly Driver program! Invest in bicycling. Invest in communities. Invest in your future. Invest in the League. Join us today and be counted in the growing number of Americans who know the transformative power of the bicycle. With your membership, you’ll receive our publication, American Bicyclist, plus a member card good for discounts at dozens of retailers, tour operators and bike manufacturers as well as great perks like Bicycling Magazine, t-shirts and more. During our Spring Member Drive, all new and renewing members are entered to win a new step-through e-bike from Story Bicycles--check them out at storybicycles.com--or a shipping box and travel voucher from BikeFlights. 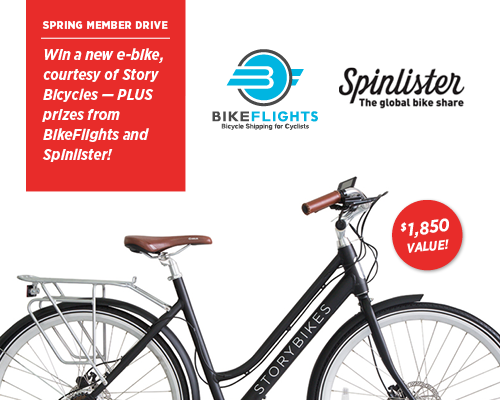 Every member will ride off with $20 in bike rental credit, courtesy of Spinlister.com!